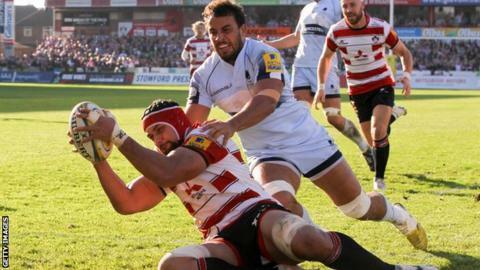 Gloucester recorded a narrow win over local rivals Worcester at Kingsholm. After Cooper Vuna cancelled out Richard Hibbard's early try, a score from Sione Kalamafoni and the boot of Billy Twelvetrees put the home side 16-7 up. Warriors hit back through a Ryan Mills penalty and Niall Annett's converted try but a Twelvetrees penalty gave Gloucester a slim 19-17 half-time lead. Vuna's second touchdown put Worcester back in front but David Halaifonua crossed to settle a tense second half. Gloucester were made to work hard for their second Premiership win of the season by a determined Worcester side, who opened their campaign with a surprise victory over Northampton a fortnight ago. The Cherry and Whites largely dominated territory and possession but Warriors were clinical when they had chances and punished errors from the home side. Gloucester could have gone further ahead in the second half but Jonny May had a try ruled out by referee Craig Maxwell-Keys, who blew up for a forward pass without consulting the television match official. Worcester prop Nick Schonert was shown a yellow card late on following a series of infringements at the scrum but Gloucester, despite their numerical advantage, were unable to stretch their lead and had to repel a Warriors attack in the closing stages. "I'm all for not going to the TMO on too many occasions but the referee did make a mistake and made the wrong call. "It cost us a bonus point and the try would have sealed the match at that stage. "However for large parts of the match we were in control but couldn't turn our pressure into points. Huge credit for Worcester for they were hard to beat." "I'm disappointed not to sneak it at the end. We could have won as there were a lot of offsides in that final surge. "I'm now dealing with a dressing room that believes we can win every game. "I'm not saying we should have won the game but we looked more dangerous than them but we couldn't get enough field position." Gloucester: Sharples; Halaifonua, Twelvetrees (capt), Meakes, May; Hook, Heinz; McAllister, Hibbard, Afoa, Savage, Kalamafoni, Moriarty, Kvesic, Morgan. Replacements: Brooker, Thomas, Doran-Jones, Stooke, Rowan, Braley, Burns, Purdy. Worcester Warriors: Pennell; Vuna, Olivier, Mills, Biggs; Heathcote, Arr; Leleimalefaga, Annett, Schonert, O'Callaghan, Cavubati, Dowson, Mama, Van Velze (capt). Replacements: George, Rapava Ruskin, Rees, Barry, Cox, Mulchrone, Lamb, Howard.